If you go on frequent camping trips, then it’s probably a good idea to get the best portable camping toilet. While you may not necessarily mind doing your business in the wild, it’s still great to have the comfort, convenience, and ease that a portable loo brings. 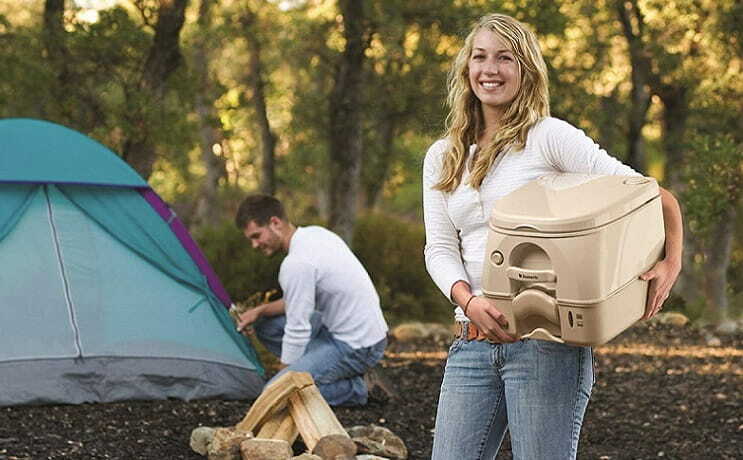 Portable camping toilets are relatively inexpensive and they are hygienic and easy to use. It just makes sense to invest in one for your picnics, hiking, hunting, fishing, and camping trips. There are lots of different options on the market, and we’ve researched dozens of them to find the ones that perform the best. Without further ado, here is your list of the 10 best portable toilets for 2019. Palm Springs Outdoor toilet has a waste capacity of 5-gallons which is excellent if you want to avoid having to empty it frequently. 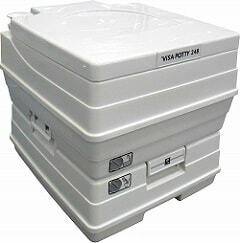 The unit is completely self-contained, with corrosion-proof side latches to secure the waste unit in place. It’s designed for easy use on boats, RVs, camping sites, and all other recreational facilities. It comes with a 3-gallon tank for fresh water for flushing and has a simple push button that operates the flush. This toilet actually flushes like the residential toilets, which most users will appreciate. The sturdy, full-sized seat has a lid and is capable of supporting weight up to 9.75 pounds which means that you will be able to use it no matter how big you are comfortable. The one-piece, leak-proof tanks are constructed from high-density polyethylene and can be completely emptied. Also, the portable toilet’s drain value is double-sealed which helps to prevent leakages from the waste liquid as well as odors. In addition to being easy to use, this Palm Springs 5 Gallon portable toilet is also conveniently easy to carry thanks to its design which includes two sturdy carrying handles. The unit’s matte finish helps to conceal the inevitable scratches that will be incurred from carrying it around often. The product comes fully assembled. The Reliance Products Luggable Loo is simple, bucket style design is highly popular with hunting enthusiasts, campers, and anglers alike. It’s one of the best portable toilets in its category, and it has an impressive number of positive feedback. This portable toilet is affordable and reliable and its functional design is excellent for use if you want to relieve yourself in a hurry. It works extremely well with sanitary bags and it’s very easy to empty and wash. 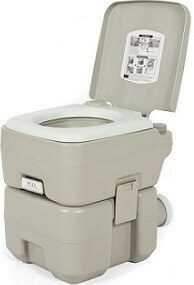 The wide base of this Luggable Loo from Reliance Products makes it very sturdy and comfortable to sit on and it won’t sink into the ground, which I’m sure you will appreciate if you have to use your portable toilet on soft terrain. 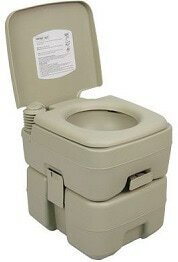 It has a volume of 5 gallons and a hinged molded seat with a snap-on cover. 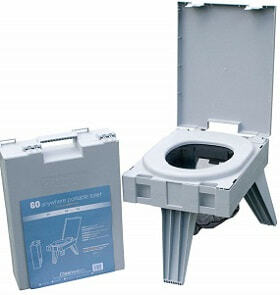 This type of toilet is great and could be the best portable toilet for camping. If you do a lot of outdoor activities that have car access, such as hiking, camping, hunting or fishing. To keep the portable toilet clean, simply use any type of disposable bags. 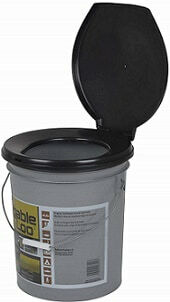 The lid provides a tight seal which keeps odors and spills from escaping, and when closed, it looks like a normal bucket. This is great to have even on those campgrounds that have bathrooms so you can avoid having to walk long distances, particularly at night. This ingenious design is not only extremely functional but affordable too. The Camco Portable Travel is 5.3 gallon portable toilet is made from durable polyethylene which means that it will last a long time. 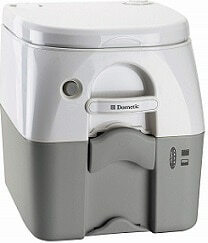 It comes with sturdy side latches that lock the tank firmly in place, and it has a very comfortable seat. The well-constructed side valves lock in odor and safeguard against any leakages. If you’re someone who camps out a lot or if you love fishing, hiking, and hunting regularly, then this is a great product to invest. It has a fresh-water tank that holds up to 2.5 gallons of water, and the flush is operated using a bellows system. When empty, this portable loo only weighs 10.8 pounds. This means that you won’t have any trouble carrying it from your vehicle to your campsite and back again. But don’t be fooled by this unit’s lightweight nature, it can easily support weights of up to 330 pounds. This Camco standard toilet is also conveniently easy to empty. Just unclip the waste tank from the seat and the freshwater tanks and empty the tank before clipping it all back together again. This product is classified as one of the best sanitation options available on the market today, and rightly so. It’s portable and lightweight and comes in a sleek, modern design that gives a ‘home-like’ feel. The seat is comfortable and full-sized and the toilet also boasts a number of functional accessories like the holding tank level indicator and the toilet paper holder. This reliable product has a waste capacity of 5.5 gallons. It also has battery powered flush controls, which I’m sure you’ll appreciate if you love taking your small kids camping or hiking with you. The unit has a sturdy handle for easy transport, and it also has an optional hold down kit which helps to secure it to the floor so that it stays in place while you are on the road. 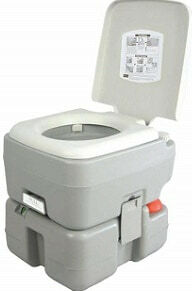 Another great feature of this portable toilet is that it is water efficient and very easy to maintain. 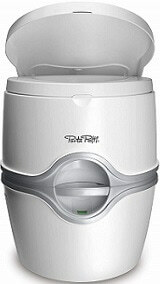 Considering all these great features, the Porta Potti Toilet is surprisingly affordable and would make a great investment if you spend a lot of time camping, RVing, or boating. This model has a waste capacity for about 4.7 gallons and a 2.4-gallon freshwater tank for flushing. It has an easy to use, replaceable piston pump that has a two directional rinse for better bowl coverage. If you have ever had an experience with a portable toilet that didn’t flush properly, then you will know why this is a feature that most users value. The bowl is extra deep which gives added comfort, and the lid snaps shut which prevents vibrations while in motion. It has a seal which is leak and odor proof to prevent any unpleasant smells or leaks especially while you’re on the move. This unit has a tank waste level and a freshwater level indicator that are both easy to read, which means that you will always know when it’s time to top up the fresh water or empty the waste tank. The toilet is also extremely easy to clean. When it comes to portable toilets, we want the convenience of a low maintenance potty, and this one gives you exactly that with its detachable spout storage compartment and the holding tank vent which makes it easier to discharge waste. If you are exploring for the excellent toilet then this one is worth checking out. This portable toilet has a waste capacity of 5.3 gallons, which is ideal if you don’t want to be emptying out your toilet frequently. The unit comes with a bellows pump which has a 3-way flush nozzle. It also has a 3.2 gallon tank for fresh water which allows you to toilet flush up to 50 times, and each time you pull that flush lever the toilet rinses the bowl very well. The conveniently accessible holding tank makes for easy waste disposal and the drain valve is double-sealed to prevent any bad odors or leakages. This portable toilet comes with an attached cover which you can close when the toilet is not in use to ensure that water doesn’t splash, particularly when traveling. The lid is also ideal for keeping things tidy and hygienic. While this product from SereneLife is priced a bit higher than most on our list. It certainly gives great value for money thanks to its rugged construction which provides reliable use month after month, and year after year. Thanks to its hard-wearing design and the high-density polyethylene used in its construction, this product can handle frequent use and is corrosion resistant as well. It’s also very easy to clean. All these great features together earned it a spot on our list despite its being somewhat pricey. This product has been on the market for almost a decade, and it’s still as popular as ever thanks to its simple but functional design. It’s portable, has a built-in carry handle, and looks a little like a briefcase when it’s packed. Its lightweight (8 lbs) and very easy to carry around and to store which you will find very convenient if you move around a lot during your outdoor activities. But don’t let the compact, lightweight features deter you. With an astounding weight capacity of up to 500 lbs. this little thing can actually take the weight of any self-respecting sumo wrestler and survive intact. It stands on three very sturdy, foldable legs, and has a removable cover which you can use under the legs to prevent them from sinking into soft ground. This system sets up in a few seconds. All you have to do is to unfold the legs one by one and lock them into place. The bowl and seat are the same dimensions as a home toilet which means that you’ll be experiencing that same level of comfort when you use the Cleanwaste Portable Toilet. This 5 gallon portable toilet from Best Choice Products is a high-performance unit which takes the “porta petti” standard to a whole new level. In addition to being portable, lightweight, and conveniently easy to use and clean, this toilet also has water saving features and is odorless which makes it a perfect addition to your outdoor equipment especially if you’re on an outing as a group. If you have been hesitant to take long trips, hikes, or hunting, fishing, or camping weekends simply because of the lack of adequate outdoor plumbing, then this portable toilet may just be the solution you’ve been searching for. When nature calls, you have no choice but to obey, but you get to choose where and how. And how doesn’t come any easier or more convenient than this heavy-duty toilet with dual spray jets that provide a clean flush with a clockwise rotary flow. Whether you get this for yourself, or as a gift for family or friends, this comfortable portable toilet is perfect for all outdoor enthusiasts. 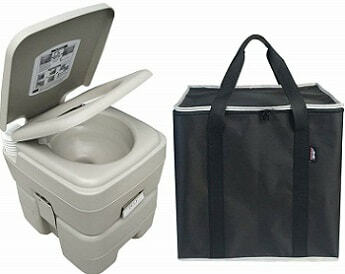 It features a full-size seat and a detachable polyethylene waste tank which is completely leak-proof. The 3 gallon freshwater tank provides for up to 50 flushes and the toilet can take weights of up to 440 lbs. This is an adult-sized toilet that comes with an elongated seat. The body of the part is made from the most durable ABS which doesn’t scratch easily. It comes with a clean water flushing mechanism which you prime with a hand pump. All you need to do to flush this portable toilet is to press a button to add water, and the waste is emptied into the storage tank. Only a pint of water is used with each pressurized flush which means that you won’t have to refill the water tank too frequently. There are level indicators to show you if the tank needs emptying or if the water needs refilling. Also, this portable toilet has a convenient extra-long spout and air vent which make emptying it a lot easier. All in all, this is an excellent product that would make a great investment if you’re searching for the best portable camping toilet at an affordable price. This new design boasts a 3 directional flushing system which provides full bowl coverage. It flushes quietly and leaves the bowl clean. It’s made from high-quality polyethylene which means it’s sturdy and durable. 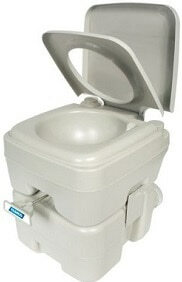 If you’re searching for a portable toilet that can be used for a long period of time, then this could be what you need. The Leopard Outdoor portable toilet is great to take on those camping trips, or weekends spend hunting, hiking or fishing in the wild. It has a holding capacity of 3 gallons and comes with a convenient storage bag which is washable and makes transporting your portable toilet a breeze. When it comes to portable toilets, there are so many different options on the market that it can be a little overwhelming trying to figure out which one best suits your needs. If you’re in the market for a new portable toilet but have no idea which ones are the best to choose from, then use this article as your resource to help you choose the best portable toilet from our list? Each one of the toilets that we have reviewed here will give you great value for money. Just look through the reviews and pick the one that has the features that meet your specific requirements.